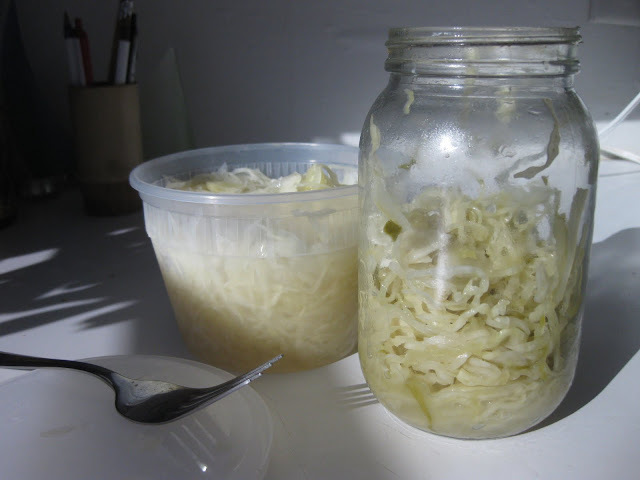 After I first made my own sauerkraut in my Master Food Preserver class, I became kind of obsessed with the stuff. Whereas before I didn't even like it, I now crave it and am extremely interested in all the different local versions of it. Then I moved up to Munjoy Hill and discovered all things great about Rosemont Market, including- you guessed it- Morse's pickles. I treasured my $6 quart of sour garlic pickles and portioned them out slowly. So when I went to visit a West Coast friend now working on a Maine windjammer in Camden, I swerved a little when I saw a sign off of Route 1 that said "Morse's 7 mi." I made the pilgrimage down the long, bumpy back road and was rewarded with the Euro Deli. There's a sit-down restaurant, a store full of European goods, and a cooler full of pickles and sauerkraut. Yes, I'd like all of those things, please. I took home a quart of sour pickles and a pint of sauerkraut for $6 (same price as pickles at Rosemont!). Score. Then I realized I had a lot of sauerkraut in my fridge. Y'see, I bought two jars of sauerkraut from Thirty Acre Farm in November, hoping to take it home for Thanksgiving. Then I realized you can't take canned goods on a plane (at least not in your carry-on). So the most logical thing to do is to have a kraut off. Now this is not a scientific taste test—there's no blindfolds, no multiple testers. Just me, a fork, and two jars of kraut. The reason I was munching so slowly through the Thirty Acres Farm (TAF) kraut is because it tastes kinda... funky. While I just happened to receive jars with no label, so I can't be sure, I think I bought the regular 'kraut, not the juniper and caraway one (plus I don't see any spices). So I don't know what could be responsible for the strong aftertaste in TAF's kraut. But it takes some getting used to. The cabbage is shredded into very long pieces, so it's kind of like eating spaghetti without a knife or a spoon. And there is a lot packed into the jar. Morse's sauerkraut is more mild than TAF's version. It is slightly more vinegary, less salty, and doesn't have too much of an aftertaste. It's super crunchy and juicy; very fresh tasting. It certainly doesn't pack the punch of the garlic sour pickles, which get you in the same spot that Sour Warheads candy do. I'd say Morse's pickles win. Oh, and TAF's kraut. 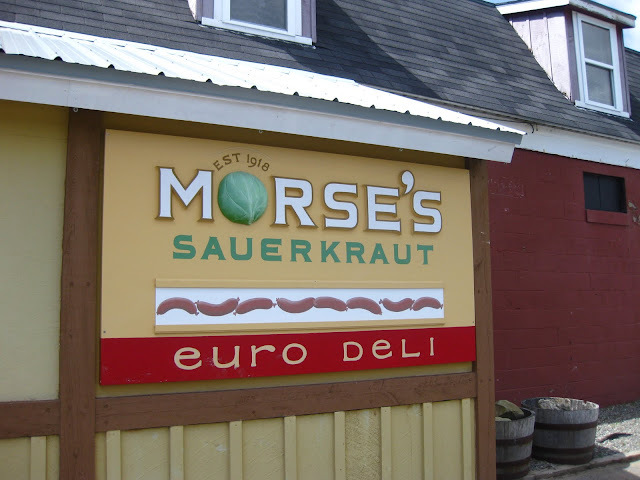 While it takes some getting used to, I prefer the stronger flavor of the TAF kraut to Morse's. However, the gold standard is the one I made in my food preservation class, from the Nat'l Center for Home Food Preservation. The above two are definitely worth a try, and please let me know where you get your fermented food fix! Use firm, freshly harvested heads of cabbage. Remove outer leaves, rinse heads, and quarter and core. Shred the cabbage into strips the thickness of a quarter. Pack one cabbage into a fermenting container. You can use food-grade 5-gallon buckets (ask delis for their pickle buckets), other food-grade plastic containers, or a special fermenting crock (we got our's from Cabela's). Add 3 tablespoons of salt and mix with your hands until salt draws juice from the cabbage. Repeat process until all cabbage is shredded and mixed in the container. If liquid does not cover cabbage, add boiled and cooled brine (1-1/2 tablespoons of salt per quart of water). Add plate and weights (a big rock, washed and wrapped in plastic will do). Keep in a cool area (50-70 degrees F) for 3 to 6 weeks. 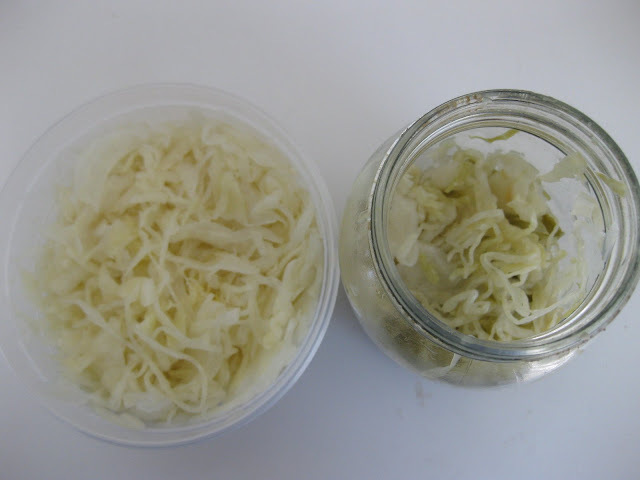 Check sauerkraut frequently- two to three times a week and remove the scum that forms. Fermentation is finished when kraut stops bubbling. Store in the fridge for a few weeks or heat process in jars (see processing chart on the Center for Home Food Preservation). Morse's is great, yeah. 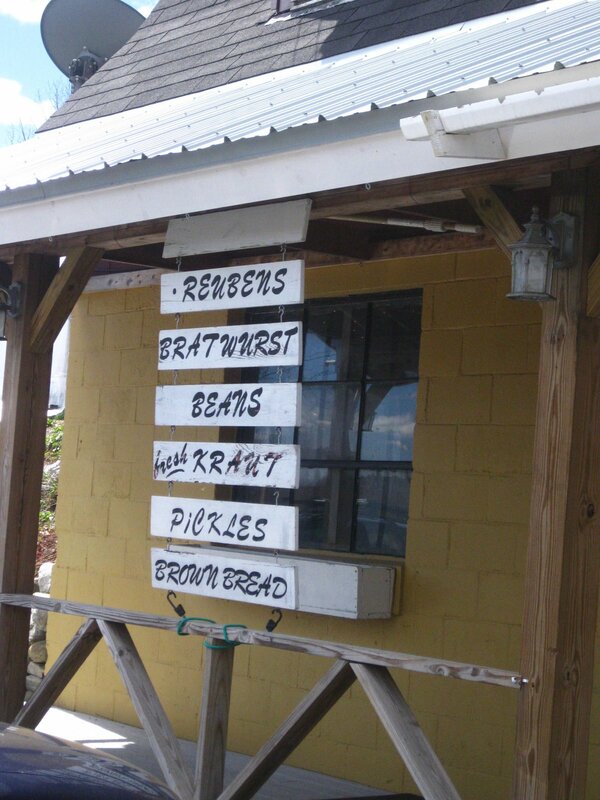 I remember when they were just a shack: kraut barrels inside, rotting cabbage heads out. They've come a long way. So educational!!! 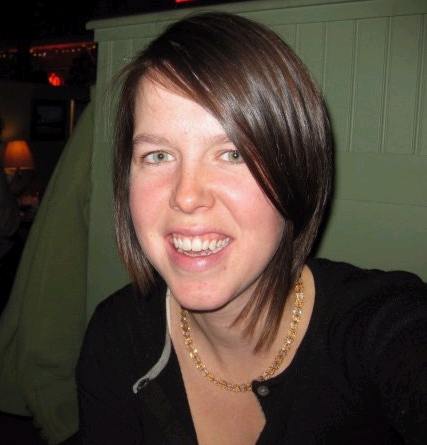 Great post Kate. and I used to hate that kinda weird food too, but pickles and coleslaw and sauerkraut is just so damn good! On my list for next time home: make sauerkraut. Nice post, good to know which Kraut to get. Just so you know, Rosemont stocks both TAF and Morse's kraut and pickles, as well as TAF's other lacto-fermented products. TAF is indeed strong, but there's no sugar added (as I believe there is with Morse's), and the "funky"-ness comes from a lot more live fermenting going on in the jar. All a matter of personal preference, of course, but you're right the profiles are quite different -- due to the intentions of each producer. 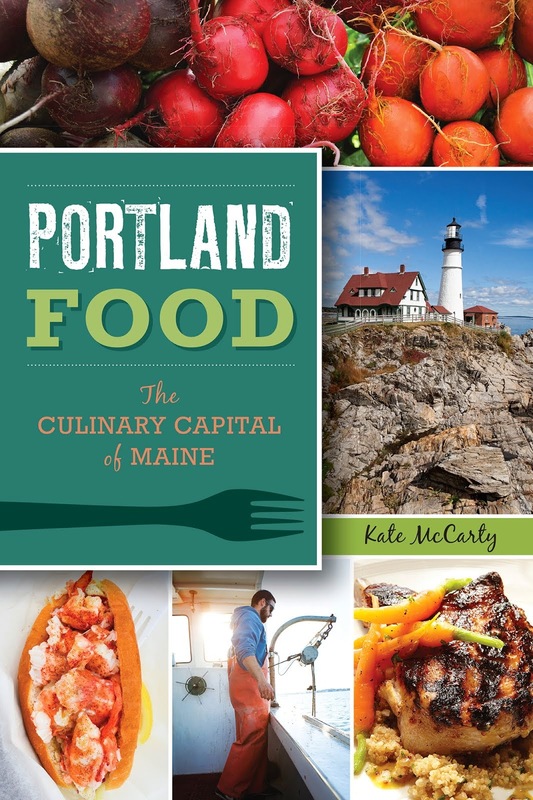 Isn't it great we have such a bounty of local producers?! I think I'll put this on my list of things to do when I have time (and that's right around the corner!) 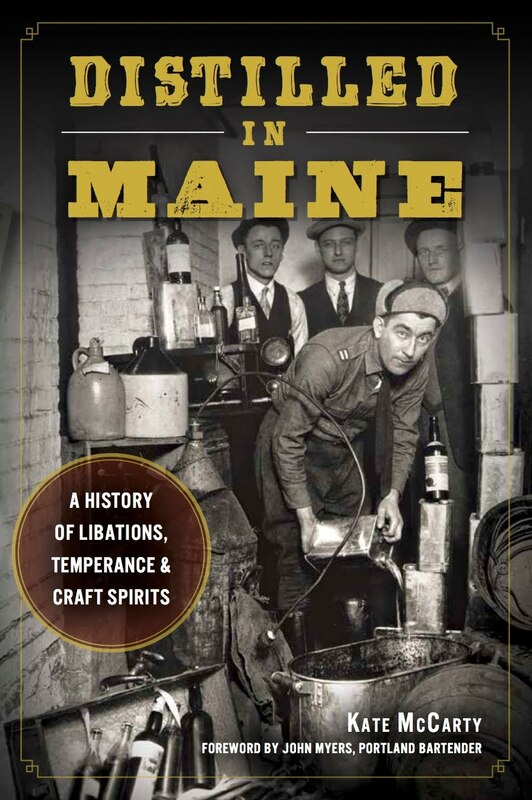 Sounds so good - and I can get Buck to make some kielbasa to go with it!